Comes with reverse movement prevention function which can stick tape quickly after it has been cut!! Only supports use of OPP tape that prevents reverse movement, does not support use of craft tape and fabric tape etc. Tape not included. I use it when packing goods. The part of the tooth quickly became useless. It may be because of it. A little heavy. This review is about item#6846077. Recently it is very convenient for many net related packing! It is! . You can easily paste gum tape etc. This review is about item#06846077. I used items of this shape for the first time, but I thought that it was surprisingly easy to use. The part where the tape is attached with the static electricity of the red part is functioning well owing to it (it may be attached if it is a thin tape?) But it will be apart in the work at the place where the wind exists. Even if you are away, there are parts that hold the tape further under the black roller, so there is no need for the tape to rewind or stick to each other, so workability has improved. I am amazed that you can buy this made things for hundreds of yen. By the way, the tape we are using is the impression of using a little thick "Nichiban carton tape No. 640PF" handled by Monotaro. It is the best among the things I have used until now. I make around 100-200 corrugated paper every day, but it is very easy to use. You can stick quickly quickly, the first person may take some time to get used to, it is recommended for workers and those who use it everyday. TRUSCO also has a carton sealer, but as for the lighter one, it is difficult to stick a little because the frame is distorted, firm one is slightly short because the grip is a little short, so it is hard to use it subtlely. (I am working with gloves.) It might be fine if you get used to both, but I will recommend this product if you compare. In these three types of tapes attached by static electricity part is working firmly, but it is easy to take out when a strong wind blows, so it is not recommended for work out of the field. TRUSCO's carton sealer replacement blade and carton sealer flap can be used as they are, so I think that it is good to prepare people who use it frequently. To me, it is hard to use other models anymore, so we have some reserve. At first, everyone did not use it until I got used to it. I got to use it as I knew the trick. Easy to handle, you can know the trick if you use it a few times. I think that it is a bit heavy and unexpectedly big one is a difficult point, but I think that it is satisfactory enough considering the price. After that, as you roll out the tape fast, it seems to stick. It is convenient because the handle is large, but in case of a light thing (except for a box), when you slowly put out the tape, static electricity is weak and it does not seem to stick to the guide. It is necessary to get used to some extent and the tape will be bent even in a box. I usually use it for the packaging of corrugated cardboard. Although it was explanation that tape adheres by static electricity, it does not stick at all. I feel like a defective item. Just with a sticker seems like a red seal, it can not stick with this. I felt that I had to buy such items without having to watch it. I'm sorry. I am using MonotaRO OPP tape for tape. 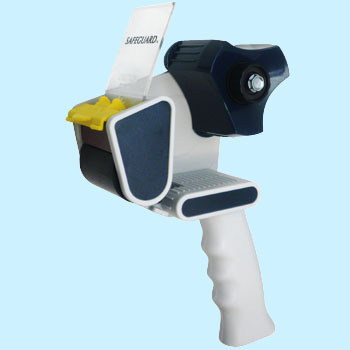 It was already in use for everyday work, but work suddenly increased and I was looking for this carton sealer. Although I used mainly mainly novice females, I got accustomed to it with ease of use that I could use with one hand and work proceeded. It holds the lid with one hand, it is really useful because it can be tightly attached with one hand. The price was also cheaper than I expected.